I received free product and/or a gift card for this review. All opinions are my own and not influenced in any way. Read my full disclosure. Logic is the one of two subjects I nearly failed in college (the other was chemistry). So, the thought of formal logic instruction for my middle schooler is daunting. Logic isn’t a necessary subject for her transcript or getting into college later, but when I look at what the study of logic teaches I can’t imagine NOT presenting it during middle and high school. I’ve heard many good things about Traditional Logic I Complete Set from Memoria Press, so I was excited to review it with Miriam. I planned to begin the study of logic with her in 7th grade, which is next year. I decided she was close enough to go ahead and get started for the purpose of this review. Memoria Press recommends this product for high schoolers or mature 7th or 8th graders. I have to admit that logic is still Greek to me. It really just makes no sense at all, and I am not going to be much help teaching this program. That’s why I breathed a sigh of relief that this program has DVD lessons… and an answer key. I’m definitely going to need that! This program includes an “in-depth study of the syllogism, taught in the traditional three-part method.” See Greek for sure. But this curriculum was also specifically designed for a teacher with zero logic background. This is definitely the kind of logic curriculum I’m going to need. Students learn how “the nature of anything can be categorized using the “Porphyrian Tree.” They also learn the “4 logical statements, the 4 ways statements can be opposite, the 3 ways they can be equivalent, and the 7 rules for validity” in this course. When I want to stop and say, “Wait… what?” my student is nodding her head in agreement with the instructor. She gets it, I don’t. Thankfully this course is ideal for independent learning! Watch the DVD lesson, read the chapter, complete exercises using what you’ve learned on days 1-4, then complete review exercises to make sure you understand on day five and end with the chapter quiz. The exercises are not overwhelming or long. Most day’s assignment is only one half page long. Each chapter is about 5 pages long in total and also has a corresponding quiz in the Quizzes & Tests book. This course can be completed in one semester with daily work, or spread each chapter over two weeks for a full year course. If we continue this curriculum next year I plan for my 7th grader to follow the one year plan, working on logic 3 days a week. My daughter is very advanced, and I think she will be able to complete this curriculum next year in 7th grade. I know I would not even think about starting my other children, unless they expressed interest, before high school. The course is very straight forward, but requires an understanding of advanced vocabulary. 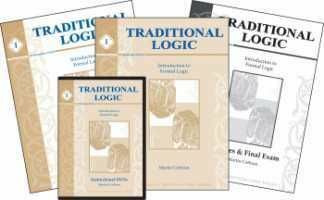 Want to read more reviews about Traditional Logic I and other Memoria Press products? Click below.